As mentioned in the general blog, I will tell a bit more details about the health of my rescue Chow Sally, so that maybe other very sick Chows get a chance. I hope that some of you will be encourage to adopt a Chow in need rather then going for the cute little fur ball we all love so much. Specially if that fur-ball comes from a puppy mill instead of a responsible breader. Anyway, Sally was found in terrible conditions in the streets of Manila. She has severe case of Mange, Anemia, generalized blood infection, nasal infection and ear milbes. The rescue clinic, god bless them still, focussed on treating the mange. When I picked her up there three weeks ago her general health had deterioated. She was weak and had fever, plus the ear milbes made her scratch the ears and open the mange wounds. Her eyes were completely covered by the infected swollen skin on her head. My Vet, the one I have for Simba and Nala, changed the medication for Sally as soon as the blood test result showed the infections. A broad band antibiotics replaced the one for the mange, we added a blood building natural medication, vitamine C and rose oil to boost the immune system. Ear drops are given to get rid of the ear milbes. After two days she improved and started eating (I feed her Holistic brand dry food, main ingredients lamb and rice, to lower risk for allergic reaction. We stay away from poultry and wheat for now. Once a week she gets now an Amitraz bath. She spends the whole day in the clinic as this medicated bath needs to dry on the skin and the dog can't swollow any amount of it, as it is poisonous once digested, even external over dosing can happen, so nothing you want to do at home. After two weeks most symptoms of the internal infections have subsided, eyes are becoming normal but discharging a yellow substance still. The blood infection and Anemia still need to be taken care off, so antibiotics, vitamine C, blood builder (iron) are to be continued for at least another two weeks. After the second Amitraz bath the skin started visibly to react positive and no only one open wound is visible and most areas are becoming free of crusts and a little fur starts growing back here and there. Now you should see how our intelligent four legged partners cope with such severe sickness. Sally is doing extremely fine mentally, she is content, she keeps her posture and shows gratitude to everyone taking care of her. When I brought her to the clinic the second time, she licked the hand of the handler and went immediately with him to the back of the clinic and I could leave for office. I'm extremely satisfied to be able to give this amazing girl a new chance in life. Hope some you can consider this for other unfortunate Chows too. Keep getting better Sally, your owners are one of many special people who can see the reward in helping the discarded Pets of which the world has too many. Last time I read one of your Post you were looking for someone to take your Chows because of a new job that involved a lot of travel, the power of Chow love must have changed your plans. What ever the reason for the change Chows in need are grateful for people like you. My Zoey was no where near as in need as your Sally, but she had a respiratory infection, skin mites and eye discharge, which still comes back now and then. Zoey was saved from euthanasia the day before her first birthday twelve years ago from last October by her late Mother Kamie. So glad to hear that Sally is doing better! Thanks for being her angel! 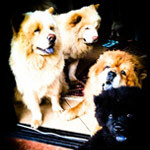 Power of Chow Love" transformed not my plans, but my helper into a true dog lover and expert. She learned everything needed in order to take care of the whole pack, not just the chows. and behave just fine. So I didn't had to find a new home for the two but even could add Sally. My travels are now also only twice every three months for a week or two. I'm really very happy how things turned out.